Welcome, Natcromo Blog Tour Visitors! In honor of (Inter-)National Crochet Month, I’ve added a lacy spring scarf pattern to my Ravelry shop: the double-flounced Emdash Scarf. It’s free for one week. Emdash has two design sisters. There they are all together at the top of this post. It’s easier to show some alternate views of them this way. Antoinette is the eldest (I published her popular pattern in Nov. 2011). She loves lace weight metallic mohair with sequins and other holiday party yarns. Cantina is the youngest, even though her pattern was published before Emdash’s (in Dec. 2015). Cantina is a freewheeling hippie girl who likes color parties, scrap yarns, and beads. How did Emdash get her name? The last part of her design story is that I learned how to format and print out kit patterns with the Emdash Scarf, for the show booth I had last summer. This means Emdash is also available as a printed pattern while they last. New Lotus Yarn Colors: Help Us Choose! On this first day of National Crochet Month we’re fantasizing about more colors of Lotus yarn. Help us choose the next colors of DesigningVashti Lotus yarn and you might be the lucky recipient of 512 yds (two balls or 200 g) of it. 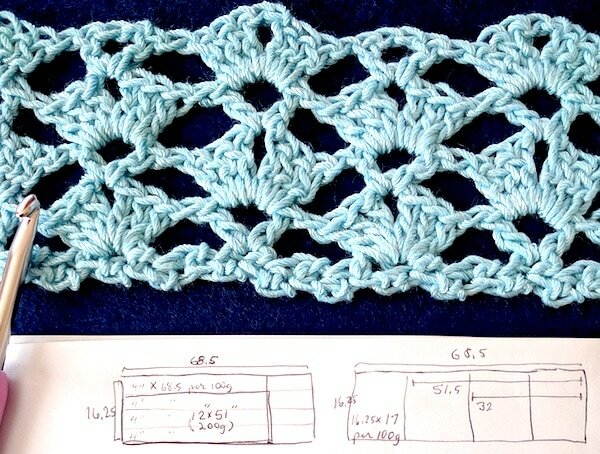 That’s enough to crochet many of these patterns, and all of the Ravelry projects that came up in this search. The existing 15 colors happen to fall into a tidy symmetry: there are 5 pastels, 5 neutrals, and 5 deep gem tones. What to add, oh what to add? 2017 Update: See which FIVE colors we added! 2018 Update: Explore albums of all the Lotus colors! What do you think our 16th Lotus yarn color should be? (You’re welcome to add a suggestion for #17 and 18 too.) Just mention it in the comments below. A one-word comment is fine. Color is very inspiring, and I’m especially passionate about color right now because I’m reading books by indie yarn dyers. So feel free to add why that color, or what you would crochet with it, or other colors you’d combine with it–whatever comes to mind. We look forward to reading every comment. The gift recipient will be randomly chosen on March 15, and announced here on this blog that same day. We’ll use a random number generator. Commenting more than once won’t increase your chances. The yarn gift can be mailed free to a US address only.